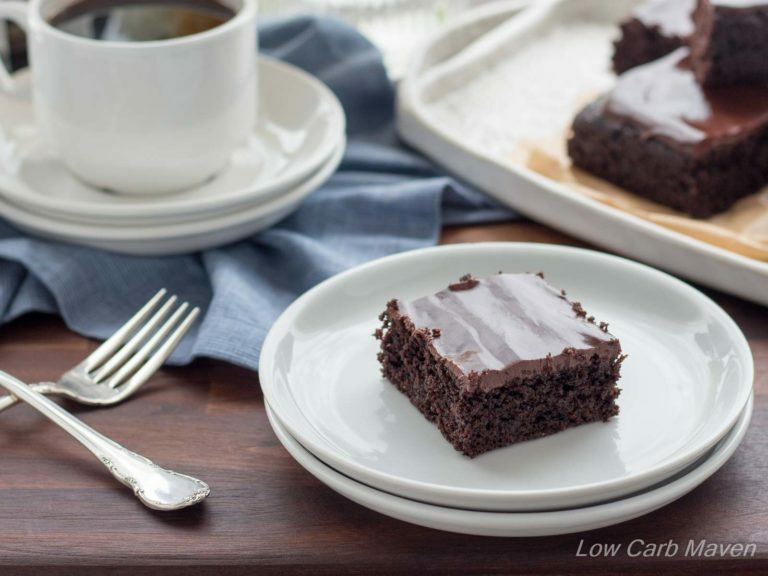 Home » Martina’s Amazing Fudgy Keto Brownies! These fudgy keto brownies were some of the most delicious low carb chocolate brownies my family has ever had. The secret ingredient? Chia seeds! 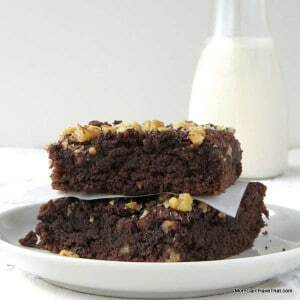 Before I begin I’d like to say that I made several recipes in The KetoDiet Cookbook (Fluffy Grain-free Sunflower Bread, Caesar Salad In A Cheese Bowl, Chicken Kiev) but the recipe my family raved about was Martina’s Fudgy Grasshopper Brownie recipe – MINUS the mint filling. The recipe can be found on page 222. These were some of the best most amazing fudgy keto brownies we have had in years. If you want the recipe… jump to the end. You won’t be disappointed. If you want to see what’s inside The KetoDiet Cookbook, Amazon will give you a peek. Martina Slajerova is the founder and author of the popular Keto Diet blog and the Keto Diet App. After being diagnosed with Hashimoto’s Disease in 2011, Martina began a personal journey toward health, discovering she could help heal her body with what and how she ate. Her success, birthed a passion to help others successfully navigate and live a ketogenic lifestyle. 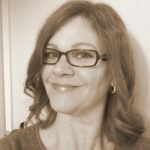 She shares great ketogenic recipes, answers questions about the Keto lifestyle, and shares lots of helpful information on her site. I was asked to review Martina’s cookbook and received a copy for review. 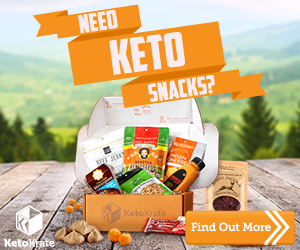 I was delighted to find such a large variety of easy keto recipes which are based on mostly fresh, wholesome foods without overly long lists of ingredients. The recipes are well written with easy to follow instructions. Each recipe includes nutritional facts, a tasty accompaniment or a companion dish suggestion. Most recipes are paired with appealing photographs of artfully arranged food. The recipes are presented in standard U.S. measurements, ounces, and grams so that anyone can make them. 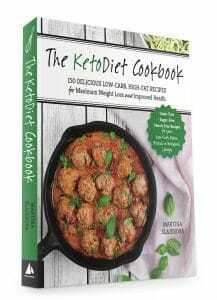 In her book, Martina provides a brief description of the keto diet and how it differs from the traditional SAD (standard American diet). She details the relationship between carbs and insulin, introduces the concept of ketones, then discusses macro nutrients and how they are calculated. She even includes suggestions on how one can lessen the effects of “keto flu”. Also included, are food lists from which one can eat Freely, Occasionally, and those one should Avoid. Martina also discusses sweeteners suitable for a ketogenic diet and the importance of weighing ingredients. 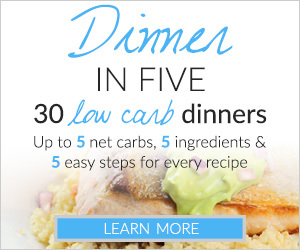 Martina’s recipes include low carb “basics” to replace traditional carb-heavy recipes or serve as the scaffolding upon which other recipes are built. She also includes a variety of recipes (about 150!) that can take you effortlessly from breakfast to dessert; recipes, that are easy to prepare! Martina strikes the perfect balance between offering comfort food favorites, classic dishes, and recipes with ethnic flair. When I look at her recipes I see variety — variety of ingredients, variety of cooking techniques and variety of cuisine! 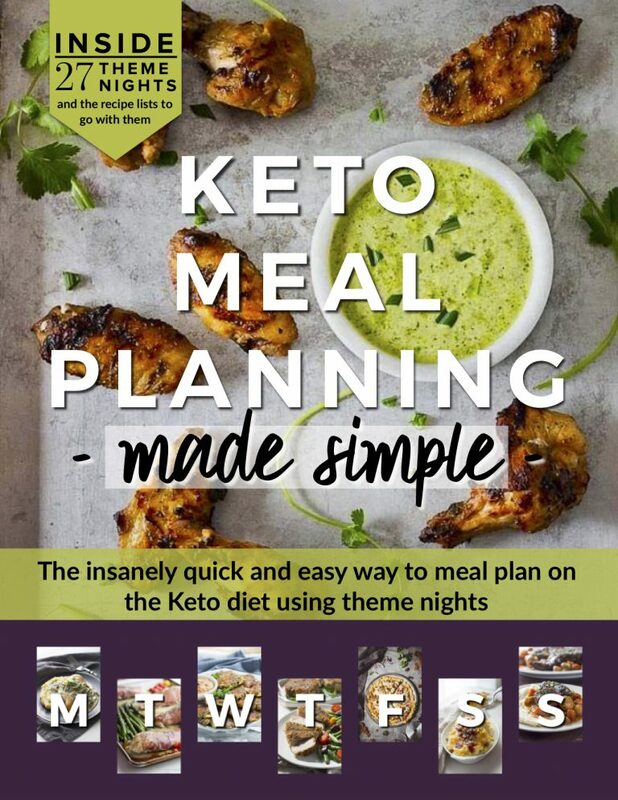 Simply put, her ketogenic recipes have mass appeal. Conclusion: I loved this cookbook for its scope of subject and breadth of recipes. The information regarding the ketogenic version of low carb diets is helpful and complete without being tedious. I believe this cookbook relevant for anyone new to a ketogenic lifestyle, those who want to change-up their low carb diets, or anyone who’s looking for a source for great tasting, whole foods, reliable recipes. Now, go get that recipe! 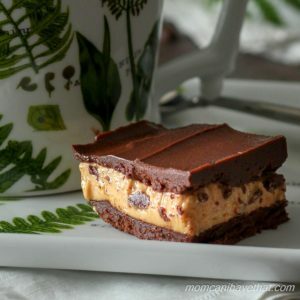 These are absolutely delicious keto brownies! My kids loved them! They are not fudgy as the name states, but are delicious. 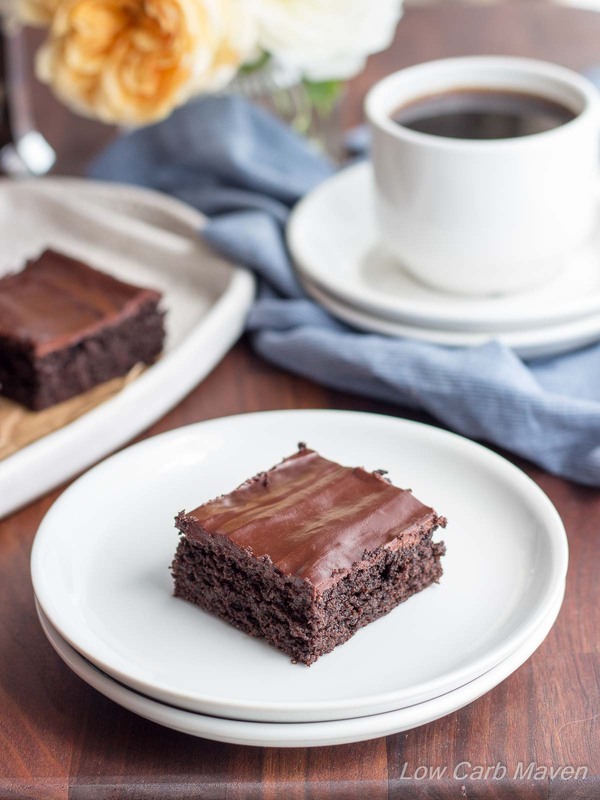 For a true fudgy banana brownie recipe try my Chocolate Banana Bread Brownies! 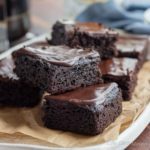 These Fabulous Fudgy Keto Brownies are 4 net carbs per brownie! This recipe includes the original recipe ingredients with the instructions written by me. Because of copyright infringement laws, I can not copy the instructions from Martina’s book. These fudgy keto brownies were some of the most delicious low carb and keto brownies my family has ever had. The secret ingredient? Chia seeds! Preheat oven to 350 F (gas mark 4) and position the rack to the middle. Spray an 8x8 square (20x20 cm) brownie pan (I used a 9x9 inch) with baking spray and line with parchment so that the bottom and two opposite sides are mostly covered. Leave the excess parchment so that you can pull the brownies out of the pan when cool. Break the chocolate into small pieces and add it and the butter into a small bowl placed over slowly simmering water. When most of the chocolate has melted, remove the bowl and stir the chocolate. Spread the thick brownie batter into the pan and bake for 15-20 minutes. Let it cool in the pan. When cool, run a sharp thin knife around the edge and lift the brownies out of the pan with the parchment. Don't worry if it cracks. Break the chocolate into small pieces and place into a smallish bowl with the ghee, coconut oil or butter. Pour the heavy cream into a small saucepan and, over medium heat, bring it up to a simmer. Pour the hot cream over the chocolate and let it sit for a minute. Stir until combined and glossy. Let it cool a bit and thicken. Spread over the brownies and let cool in the fridge until the chocolate has hardened. Cut and serve. Serves 16. Refrigerate any remaining brownies and enjoy at room temperature. NOTE: For those who have Martina's book and can't find this recipe.... This is her Fudgy Grasshopper Brownie recipe on page 222. I omitted the mint layer because my family does not like mint. I'm sorry for any confusion! *3 tablespoons of chia seeds, when ground, will equal about 1/4 cup. It's best to under-cook the brownies for a fudgy texture. How much carbs is in 1 brownie? Like what carbs per serving? I made these as described and they were awesome! Thank you for a much needed keto treat. I made the Amazing Fudgy Keto Brownies and they live up to their name. They are absolutely scrumptious! I love chocolate and have tried numerous sugar free recipes for brownies and other desserts. ALL previous attempts were very disappointing. But this one is a winner! 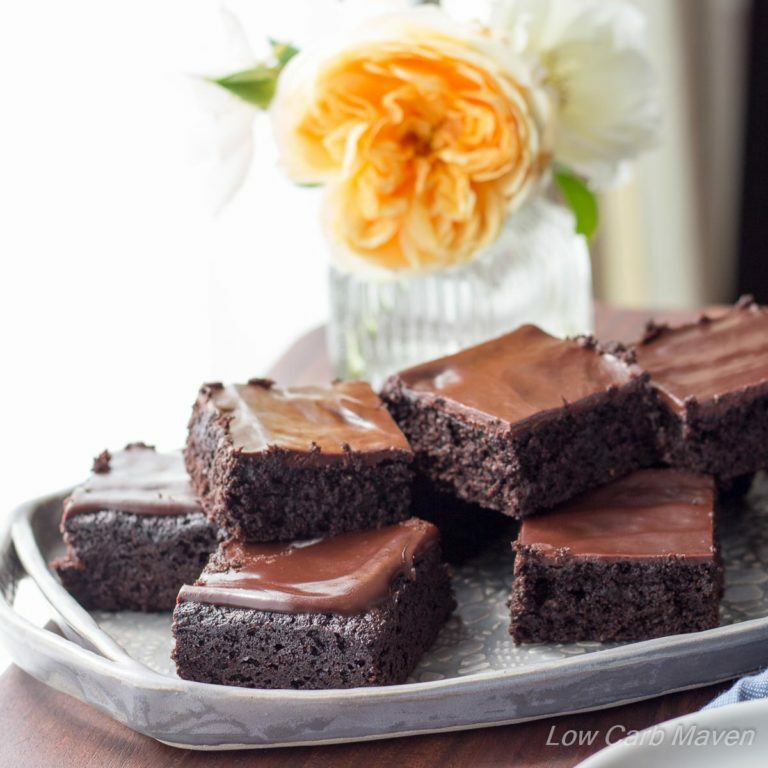 They are moist, fudgy, chocolaty and just sweet enough to be very satisfying. Thank you for a winning recipe from an ardent chocolate lover! Recipe looks good but I would use another substitute for erythritol. It is not a good product to put in our bodies. I’m going to try it but substitute for sweet potato or avacodo and just use stevia to sweeten. I’m having to cut back on my fat intake due to fatty liver disease. I had great success making a reduced fat version of these brownies. I only used 3 Tbsp butter and subbed 6 Tbsp almond milk for the rest. Instead of 3 eggs, I used one egg plus two egg whites. They came out perfect, fudgy and delicious! Great recipe. Fatty Liver disease , i think comes from too many processed foods and carbs, not fat. It is associated with high blood sugar. Substituted the chia with 1/8c of coconut flour, used 1/4 C Hershey’s special Dark &&..added 1 oz of Lily’s stevia sweetened choc. chips!! Back flips in my mouth!! ??????? My husband who loves brownies approves. I didn’t add the chia seeds because I don’t have any but still amazing. Hmmm. I don’t remember Amanda. It could be the erythritol. It likes to recrystallize. But if it wasn’t the sweetener it could have been the chia seeds? I do remember the texture being more grainy when I made them – definitely not melty and gooey like flour brownies. Can you use Coconut flour instead of Almond? I want to make these for work but my boss is allergic to nuts. I have a question, was I supposed to use unsweetened chocolate? that’s what I used and the frosting doesn’t taste very good. they are cooling now in the refrigerator not sure how the brownies themselves came out yet. I added 1/4 cup erythritol/stevia blend to the frosting. I wish I could find erythritol without the stevia, because I can tell the stevia does enhance the bitterness a bit like someone else said, but at least it’s sweet too! I used unsweetened cocoa powder in the frosting and brownie mix instead of the chocolate bar, so added extra sweetener, but definitely didn’t taste as sweet as when I’ve made brownies in the past. Probably a good thing! The frosting wasn’t mixing well, so I added a few things in the spur of the moment — about 1/4 cup of each coconut flour, cream cheese, and coffee cream, and several tablespoons of water to get it the right consistency. Might have added a little more coffee cream too (would have used whipping cream instead if I had it). I ran out of eggs, only had two, so I added flax seeds as a substitute for the amount of chia seeds stated, but added chia seeds in an amount appropriate to replace one egg, since it apparently can substitute for it. It all seemed to come out rather well! Moist and crumbly, but I haven’t refrigerated mine. Thanks, I wasn’t expecting a reply tonight, just wondered if it was normal or if I messed something up. They did set up fine as they cooled and I could have actually baked them 5 minutes less, haha. Soupy was the wrong word, I was typing while cooking, maybe goopy (haha) is more accurate. Still wet, different consistency from other baked goods. This was my first time using almond flour, so I wasn’t sure what to expect. All that being said, the brownies were delicious! My husband said they were a little crumbly, but at the same time, not dry at all. Next time I won’t add the 5 extra minutes. Would these turn out alright if I made them without the cream of tartar? What purpose does the inclusion of it serve? You are sooo right about this it seems little known and a huge problem for Keto baking when your bread comes out green or smelling like ammonia it’s because the baking soda and to a lesser extent the baking powder is super alkaline and normal baking ingredients are more acidic by nature and thus levels things out. Keto baking requires an extra acidifier :) I was so happy to see someone explain this correctly! I’m making these brownies now yum ? How do you grind chia seeds? I tried a mortar and pestle, which didn’t help at all. Then I tried a mini food processor, which also didn’t work. Is there a way that does work, or do I have to put the chia seeds in whole? I tried this great recipe both ways: one with ground chia and another with whole chia seeds. Both came out great and can’t tell the difference. Thank you, Kim, for sharing! I used a magic bullet and it worked great. This recipe looks and sounds amazing, will try it out for sure! Can I use only erithytol or xylitol, skipping altogether the stevia?? Thanks for sharing all this greta stuff with us!! I used 96g of Natvia which is a Stevia/Erythritol blend. It’s usage is spoon for spoon with sugar so used less than the recipe stated. In a moment of madness I pushed in some frozen blueberries and baked for an extra 10 minutes… good news is they came out perfect. Great recipe which I’ll use again. Can you use Swerve instead of the other sugars? Hi 5here.,….can I sub powdered stevia….and if so how much? Also, I dont have powdered erythotol….can I use Xllitol? Thank you for very very great recipe! I baked it today and couldn’t stop picking for only one piece to eat!!! I love it sooooo much??? It’s amazing like its name!!!??? Does the chocolate have sugar in it??? OK So I had to comment on this after making them and reading your comment about them NOT being fudgy. I cooked them for about 15 minutes, and they are SOOOOO fudgy. Like nearly fudge with a hint of brownie. They hold well, and they are amazing. I would highly suggest baking them for less time to see if you enjoy them more and get more of that fudge brownie texture. I keep them in the fridge and just let them come to room temp before eating. Absolutely my top low carb brownie recipe, it has now won over the other two I was using. These are now in our Keto family favourites scored a 10/10 by 4 fairly fussy Keto kids! Thanks ? ? On a side note we substitute the chia with 1/2 cup of coconut flour to soak up the liquid a little & omit the frosting, makes them very lunchbox friendly ? I complete forgot to put the chia, now I have a very oily brownie… is the chia responsible for the dryness of the brownie??? I think that next time I will have a great brownie to enjoy with my family? Amazing recipe. I have tried a few but these are incredible! Thank you! Sounds very good but what does “15-20 teaspoon drops” mean? Is it drops or teaspoons? I used unrefined coconut oil and they turned out very fudgy. I had also planned to use ground flax seeds instead of ground chia seeds… But I forgot. Maybe that has something to do with it? Anyway, these are incredibly rich and definitely hit the spot for our St. Patrick’s day tradition. 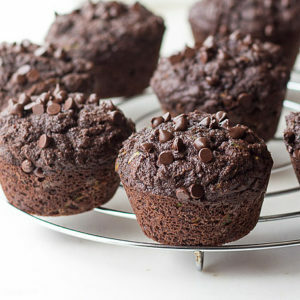 Just made these now, adding less chia seeds and used some espresso powder, they came out delicious! In my oven, I baked them for about 25 minutes. They were a tad crumbly but no one complained about that! This recipe is a keeper, thanks for sharing! I also baked before reading the reviews. I wish it was more clear that the chia seeds should be measured out before grinding. Recipe says 1/4 cups GROUND chia seeds, but apparently it should actually be 1/4 cups chia seeds, which are then ground. 1/4 ground chia is much less that 1/4 cup whole. Hi which is it? Measure 1/4 cup before grinding OR after? whats the fat, carb and protein content per serving? Kim, you deserve a medal (several!) for putting up with so many whinging, whining, lacking-in-common-sense people in the comments. I followed the recipe and mine turn out to be pretty crumbly and dry, like eating a sandy chocolate cake. If I made them again I would probably add another egg and A few tablespoons of cream to the batter. The chia seeds were craving some moisture to soak up. I was surprised that the recipe didn’t call for any moisture other than eggs and butter. The icing is fabulous though. I’m allergic to chia seed. Can I leave them out or should I replace them with something else? Hi Lori. That would be a question for Martina as she is the one who engineered the recipe. Links are included for her blog in the post. I have my pwn great brownie recipe, but it has one small banana in it. It’s really, really, good. If it’s something you are interested in, here is the link Chocolate Banana Bread Brownies. Thank you, Kim! These are wonderful! I’ve tried other keto-friendly brownies, but these are the best! I think I might have under-baked them, but the piece I ate was so good! I refrigerated the rest to see if I need to adjust the bake time for my specific oven, because these will definitely be in the rotation! Finally some sweets on this diet! I substituted Swerve in the brownies and coconut oil in the frosting and was pleased with the result. Refrigerating them overnight before cutting made them crumble less and I actually prefer them cold for the chewy consistency. They are better than any Atkins treat I have ever tried. Thanks for sharing the recipe! Hi, I’m dirt free so is there another option to the whipping cream? Also, can I use cacao or does it have to be cocoa? Thanks so much…can’t wait to try them! These are good. A little crumbly like someone else said. Be sure your eggs are room temp or they will not integrate with the chocolate. Good chocolate flavor. Will make again. Mine also came out very crumbly almost like Oreo crumbs, so I just added a big dollop of organic whip cream and secretly indulged. Hi Kim! I can’t wait to make this recipe! I am confused on what size pan to use in order to get the correct nutritional values? Do I use 9X9, 20X20 or 8X8?? And then I cut them into 16 squares when done? Thanks for your review and posting of the brownie recipe. I use Martina’s app and with the keto diet I have lost almost 20 lbs since Jan. I live in a more rural part of the State and the only product I can find that is close to erythritol is Pyure. Can I use that as a substitution? It has erythritol as the main ingredient and mixed with powdered stevia. That’s ok… I had bought your cookbook 2 weeks ago and hands had a chance to look at it.. found my answer in it..
Hi.. these look delicious… I was wondering if there was a non dairy alternative to the heavy whipping cream as I can’t have it… would coconut cream do? I rarely like LC desserts. This recipe, however, is the exception. These brownies were surprisingly GOOD. I think they’d also be good with peanut butter mixed in with the top layer for a variation. Kim, I am so intrigued! I will have to check out this book. It looks like an inspiring, educational book! The brownies look AMAZING! Love that they are guilt free!!! Thanks for the great review and recommendation! Thank you for this recipe. I hope to make it my birthday cake. That is, if I ever figure out what I’m doing wrong and actually lose some weight. These look really good and I would love to try them, but when I printed the recipe, the nutrional information says they have 20 grams carbs and 7 grams fiber. This page says 7 grams carbs and 3 grams fiber. Which is correct? I don’t get this at all. I bought the Ketodiet Cookbook by Martina but this recipe is not in it. I want to try it but find no way to print it off so I can make it. I tried to copy and paste but it messes with my Explorer and won’t let me copy and paste it. How the heck do you get the recipes off this blog with no print button. Good Grief I finally found the teny tiny print button. YOu need to make it bigger so people see it. And this recipe is not in Martina’s Ketodiet Cookbook. where did it come from. Mine turned out rather crumbly. Any suggestions? Taste wonderful and still moist but crumble and fall apart. Ended up more cake texture than fudge. Maybe my chia seeds not ground enough? I don’t know how much cocoa powder to put in, the ingredient list is not complete. The recipe does look awesome and easy, would love to try it!